Ever since this moment I choose to communicate instead of bottle up my frustrations, the whole atmosphere of work has changed. We still aren't perfect, we still fight, but peace has so flooded the situation that the turmoil I was facing on a daily basis has vanished. This was rocking me to the core, it was like someone was slowly pulling my heart apart like it was a wispy piece of cotton candy. Shredding, yet whole and taking on a whole new shape and identity. I wanted to share this post this morning as it is resonating in my life with deciding how many chance do I give a person. How much grace is in my heart. I will choose to believe again. I will no longer live in the secrete dark places that fear drags our heart into when we are don't know what direction is up. I will live in truth, the light and have peace if my life. Three little words that may dictate your every emotion and reaction when life turns upside down. What new experience have you encountered recently? Did it bring you freedom or chaos? Need more impute and want to share your blog? Check out this amazing Community. Check out this incredible post from The LastLeaf. It wonderfully captures the reality of anxiety. I have suffered with some of this myself and wanted to share this great find as a gem in the blogging world. Please share some love and comments on the original post and feel free to leave comments here as well about your experiences with Panic attacks. When someone is going through loss it doesn't matter what they know. Rationality can easily be thrown out the window as the pain and loss seem overwhelming. So please this week, reflect on your actions. Are you Selfless, Selfish, or do you practice Self-Control? It's time for the sushi queen to rise again. I look forward to seeing your responses Let’s make a difference! Don't fear change, embrace it! If you are unhappy with you today, look closer, dig deeper, search beyond what you know now. Because, tomorrow you will still be you, but there will be a change. Need a Community? Get exposure and view other bloggers – Check out the original post. Another Award?!!! This Blogging community is amazing. Thank you everyone for the support. So today I am praying for the winds and the rain. Sometimes we just need those chaotic moments in our lives to stir us up, and other times we need those moments of silence for the outlook to become clear so we can see what the next step should be in our hearts. Last week my husband came home from work and said it's time to learn Chinese! In two years we will be in China. New Bloggers! It’s First Friday! Be sure to go to the original post and leave your blog information for others to find. Believe in Yourself, turn the imagination of your mind into a reality taking all your Allusions and turning them into Clear Skies. This year is my year of Health. What is this year for you? I declare a blessing over everyone who read through my blog. That 2018 will be a year of great Joy. I am going to chose to put fear of what could happen to her behind me and focus on the hope of this is her life changing moment. The moment she has decided to move, she has made a choice and I pray it will better her as a person as she goes through this hard lesson called life. Check out this awesome blog today from Sweet Summer Online and her fantastic Discuss on Depression. I would like to shed some light on how the NHS support individuals with depression. My views come from not only trying to access the service but from trying to counsel clients. Usually the client/patient begins by seeing a doctor, most cases the patient/client is prescribed antidepressants and sent on there way. If you research into antidepressants, you’ll find that there is a lot to consider with the side effects. Stomp on fear as a spring board that launches us into our dreams with both feet anchored in trust and risk. That moment someone else pointed out I was on the edge so I was able to stop and see the cliff I was about to walk off of, turn around and get back on the path. Before publishing a blog post, you can add categories and tags right in the app’s post editor. 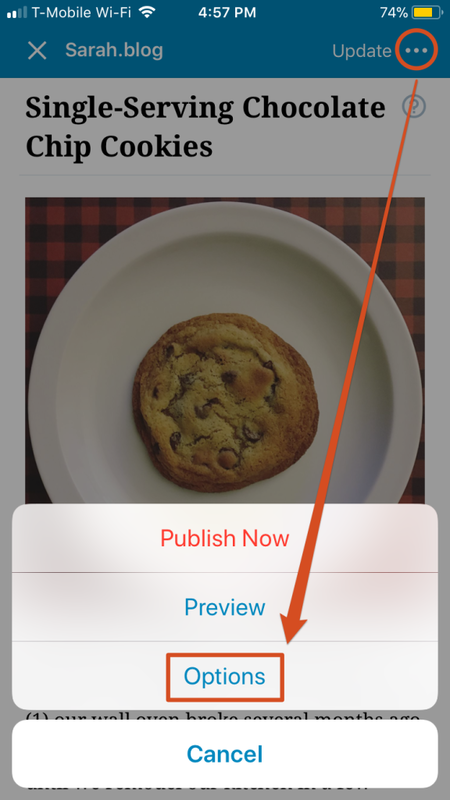 To add categories and tags to a post in the iOS editor, tap the … at the top right, then Options. On Android, tap the gear icon at the top right. So I will continue to walk this fine line hoping I don't fall off the side of helping to enabling. What is your trumpet blowing moment?